Some fall styles are out and there are good deals on summer pieces. I'm going to take a dress, top, and skirt and style them for summer and fall. The Piece: Black Maxi Dress $68 A black maxi dress is a great year round piece. Summer: Paired with a fun straw hat ($25), a coral-esque cuff ($24.50), and red sandals($50) it's a great look for a vacation or just a fun weekend. Fall: You can put a cami on top of the dress to keep everything smooth. Add a jewel toned sweater ($34.50) and a fun printed scarf ($29.95) some flats($39.90) and you are ready to go. There are endless combos for this look. The Piece: Blue button skirt $69.50 It's an easy to wear shape and it would look great at the office. I'm styling it for the weekend and date night. I would look great at the office with a blush or white blouse. Summer: Go to brunch with the girls by pairing it with a striped off the shoulder top ($36), a nautical necklace (similar $17.99) and fun sandals ($49.99). 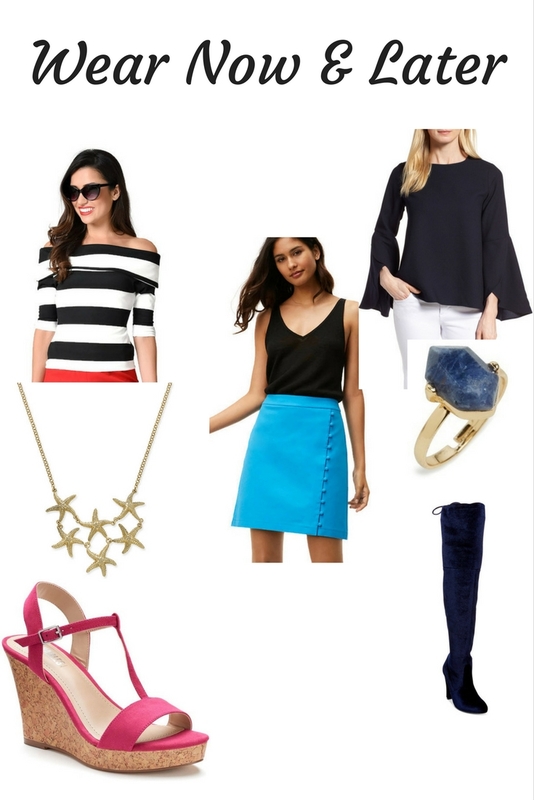 Fall: Go a little monochromatic on a date by adding a navy bell sleeve blouse ($24.97), navy over the knee boots ($32.46), and a jeweled ring($14). The Piece: Mustard Ruffle Top $34.95 Mustard is one of my favorite fall colors but it's great in the summer too. 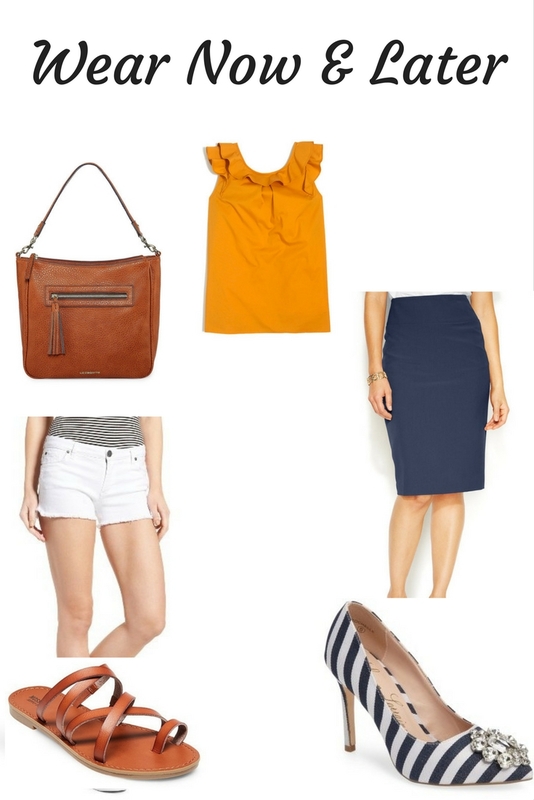 Summer: This is a great weekend look with white denim shorts ($39), brown sandals ($15.99), and a matching tote ($37.50). Fall: Take it to the office with a navy pencil skirt ($29.98), and your favorite pair of heels($49.96). If you keep your outfit simple you can really have fun with shoes and still look pulled together. Great selection! These are definitely pieces you can wear now and in the next season! I love that leopard scarf! Look really nice!!! I love the outfit!! !